SketchUp Pro or SketchUp Make for Woodworkers? What’s the Difference? When I teach a class or talk to woodworkers about SketchUp, those two questions are almost always asked. As an unrepentant smart-Alec I usually reply “$590 – the current cost of a SketchUp Pro license, SketchUp Make is free”. 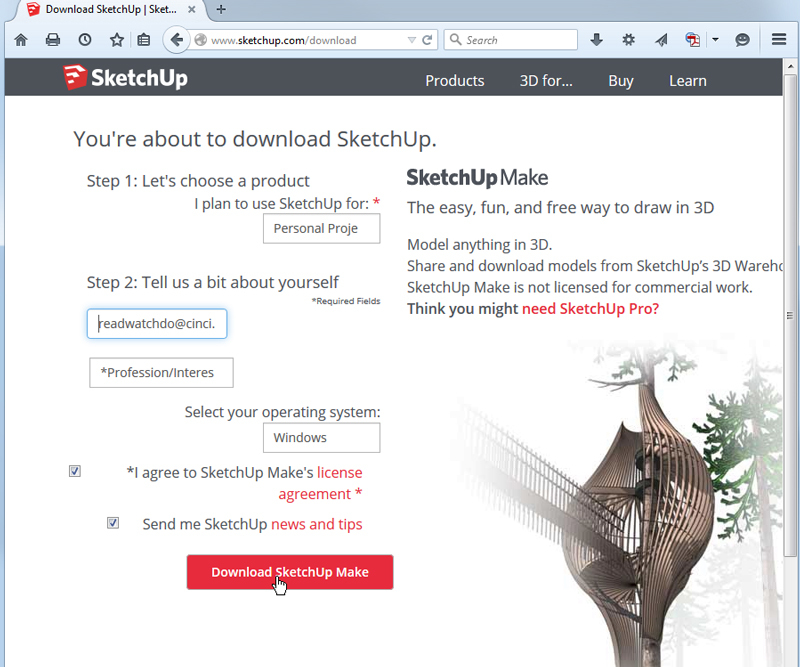 There is some confusion, mainly from new users because when you download and install SketchUp Make, it starts as a 30-day trial of SketchUp Pro. Back when Google owned SketchUp you could download either version. The policy has changed a few times since Trimble bought SketchUp. It’s understandable because SketchUp Pro is where the money is; you can’t blame the company for pushing the product that supports the whole operation (as well as the millions of users of the free version). I’ve heard stories of people downloading from other sources and receiving all kinds of bloatware and malware along with the SketchUp download. The process is straightforward from SketchUp, but they will try to steer you to the Pro version and you need to agree to the license terms. The license agreement has also changed in recent years. Here is the deal in layman’s terms: If you’re going to use SketchUp to make money, you need to pay the license fee and invest in SketchUp Pro. If you’re not making money with your use of the program, you can use the free version, SketchUp Make. After the download and installation you will be using SketchUp Pro until the trial period ends. After that, it will automatically revert to SketchUp Make. I think the price for SketchUp Pro is a real bargain, especially when you compare it to the costs of similar programs. After the initial license period, the cost is around $100 a year to keep up to date and receive technical support. So what do you get for your money? The biggest difference to me is the types of files that can be imported and exported from SketchUp Pro. SketchUp Make only imports and exports raster files, static graphic images that can’t be edited. SketchUp Pro lets you bring in or put out vector graphics. You can import an AutoCAD floor plan and model a building on top of it. You can send your model to Adobe Illustrator and create drawings that are ready to publish in a book or magazine. You can export the geometry of your model and send it to your CNC machine or 3D printer. If you understand the difference between raster and vector graphics, you’re a likely candidate for SketchUp Pro. If that’s how you make your living, the license fee is small potatoes. If you make models with lots of detailed joinery, the solid tools in SketchUp Pro make it quick and easy. The main functional difference is that SketchUp Pro includes a set of solid modeling tools. With those you can model a tenon on the end of one piece of wood (or a set of dovetails) and create the matching joinery in another piece of wood. You can accomplish the same task in SketchUp Make (this post shows you how) but it’s a little tricky and involves several steps. With the solid tools, select an object, select the tool, click on the other object and presto! changeo! the other half of the joint is there. This post discusses using the solid tools in more detail and shows how to make pins from the tails in a half-blind dovetail joint. The other big advantage of SketchUp Pro is that it comes with a companion page layout program called “Layout”. Printing is possible from SketchUp Make (this post shows you how to print a full-size pattern and my SketchUp books discuss the process in detail). 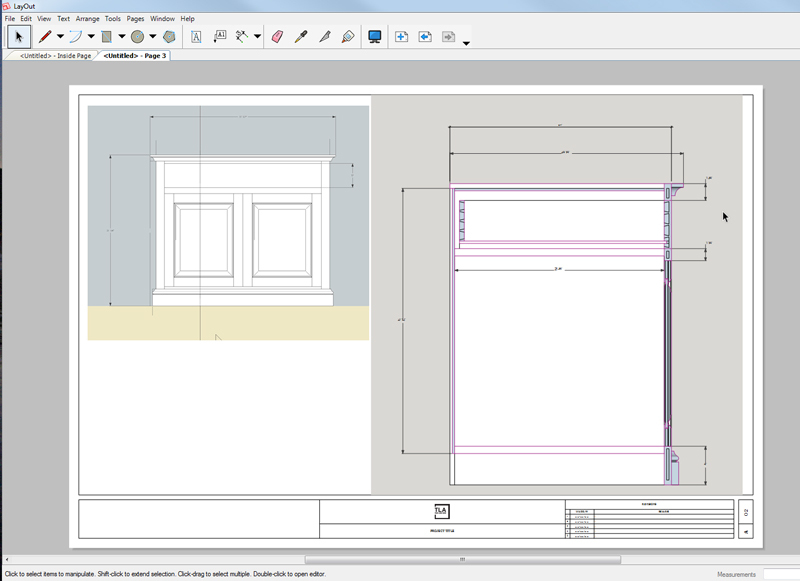 Layout makes a process that is convoluted and awkward in SketchUp Make easy. With SketchUp Pro and Layout, you can set up pages with multiple scaled views and nice looking pages. If you’re making a living with your woodworking and want to impress clients and potential clients with your drawings, Layout alone makes it worthwhile to invest in SketchUp Pro. Again, compare the price of SketchUp Pro to AutoCAD and the $590 looks like chump change. All of the above answers the “what’s the difference?” part of the original question, but leaves us with “which one should I get?” If you’re a hobbyist woodworker I suggest SketchUp Make, at least until you learn the program well enough to make an informed decision about the advanced features of SketchUp Pro. That’s one of the great things about SketchUp, you can learn how to use the program without spending a nickel and then decide if you want to step up to SketchUp Pro. A final note: if you’re experienced in AutoCAD and thinking of learning SketchUp, there is hope for you in this post. Can I also with the pro version do a layout print that includes all measurements or angles for things like open staircases?